Sled riders are more likely to be injured during collisions than skiers or snowboarders. Nearly 30% of children hospitalized after a sledding accident suffered significant head injuries – 10% had a permanent disability. 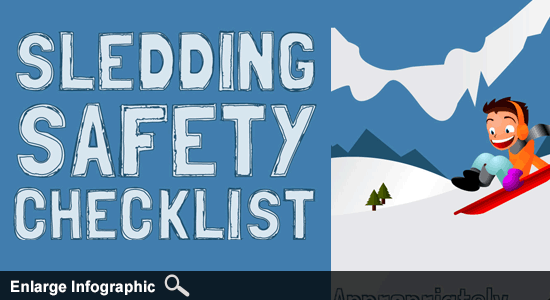 For a safe and happy sledding adventure, make sure to follow our sledding safety tips and check out our Sledding Safety Infographic as well. Bundle up – Signs of frostbite appear quickly on exposed skin when it's especially cold. Wear a winter coat, water-resistant pants, gloves, hats, and boots. Protect Your Noggin – Wearing a helmet can help to prevent traumatic brain injuries. No winter sports helmet? Wear your bike helmet instead. The Right Angle – Find a hill that isn't too steep. Make sure it flattens out towards the bottom, so you'll have an area to stop. Look Out! – Be sure your slope is free from obstacles before you take off. Keep a watch for fences and trees, as well as rocks, boulders, or covered tree stumps. Daylight Rider – Sledding at night can make it difficult to see obstacles, hazards, and even other people. Stick to daytime rides. Feet First! – Never sled with your head. Make sure you're seated feet first and facing forward. Watch for Others – When climbing back up the hill, make sure you're on the lookout for other sled riders coming towards you. Perfect Fit – Make sure you use a sled that's right for your age, height, and weight. Control is Key – Avoid sleds that can't be steered. Also, don't use objects like lunch trays or inner tubes in place of actual sleds. Passengers – Never ride with more people than a sled is designed to hold. Tricks – Avoid going off jumps or otherwise trying to do tricks while sledding. The Right Call – Make sure to bring a cell phone along with you for any sled riding. It'll be there in case of any emergencies. End of the Line – Don't ride a hill that ends with you sliding into a street or anywhere else with possible traffic. Keep these safety tips in mind for your next trip to the local sled-riding hill. With these precautions, you can keep your family safe and happy this winter. Be sure to check out our other winter & holiday safety tips. Accident injuries can burden you with mountains of medical bills, lost time at work, and an incredible amount of stress. If you or a loved one is hurt, don't hesitate to contact our attorneys for a free case review. We'll help determine your best options, and we'll work to get you the money you deserve. "Sledding Injuries: A Significat Cause of Hospitalizations, Injuries During Winter Months." American Academy of Pediatrics. October 15, 2011.